With the tight economy forcing American boaters to reconsider expensive trips abroad, the appeal of Florida yacht charters has increased dramatically in the past two years. Perhaps not on par with a Virgin Islands yacht charter, there are still plenty of points of interest while cruising along the South Florida coast, especially for charterers who also enjoy scuba diving. While the Florida Keys may be known for their fishing and scuba diving locations, both Broward and Miami-Dade counties have some of the best spots to scuba dive in the nation. From natural reefs to sunken ships, it’s amazing what can be found off the shores of Miami and Fort Lauderdale. Many of the reefs and wrecks can be found in 60 to 80 feet of water, making South Florida a great choice for both novice and advanced divers. Sunk in Sept. 1986, this 95 foot tug was seized by the government in a drug smuggling operation. It was bought at auction by a man who renamed it the “Jay Scutti,” after his son. The wreck lies in 70 feet of water and is centered between a 45 foot wreck named “Moonshot” and another named “Pride,” a 95 foot sailboat. All three wrecks are tethered together by a cable. 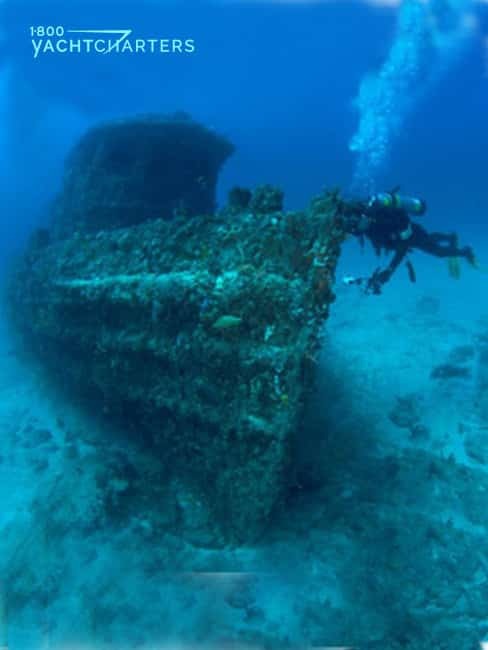 Divers can usually explore two of the wrecks in one dive. Lots of fish inhabit the Jay Scutti, and it’s possible to enter the wreck through various openings. Located just south of Port Everglades and running to the Dania Pier, this two and a half mile reef is famous for its sharks, rays, and large grouper. The front portion of the reef is in 60 feet of water, while the back side plunges to 80 feet. In some spots, the reef rises to nearly 20 feet. Tons of marine life call this reef home and make it a great spot for reef diving. It’s pretty impressive how artificial reefs have been created by linking multiple wrecks together via a guide cable. The Miami Beach Wreck Trek is a shallow dive, about 50 to 60 feet of water. It begins with a pair of army tanks on the southern end. As they swim north, divers encounter several tons of limestone boulders and more wrecks like the “Rio Miami,” a 105 foot tug which sits upright in about 65 feet of water. Fourth, also off the Miami Beach coast is a trio of sunken tug boats. The “Belzona Ona,” lies in 85 feet of water. About 75 feet away is the second tug, “Belzona Two,” in 60 feet of water. The deepest of the trio, “Belzona Three,” is a 100 foot tug at a depth of 85 feet. Finally, not far away is the “Belcher Barge #27,” a 195 foot steel barge that was sunk in 1985. The barge flipped on its way to the bottom, but experienced divers can penetrate it and swim the ship’s entire length. Please comment to let us know about your experiences diving these awesome Florida dive sites! In addition to cruising in south Florida, Bahama yacht charters are great options for closer-to-home getaways. 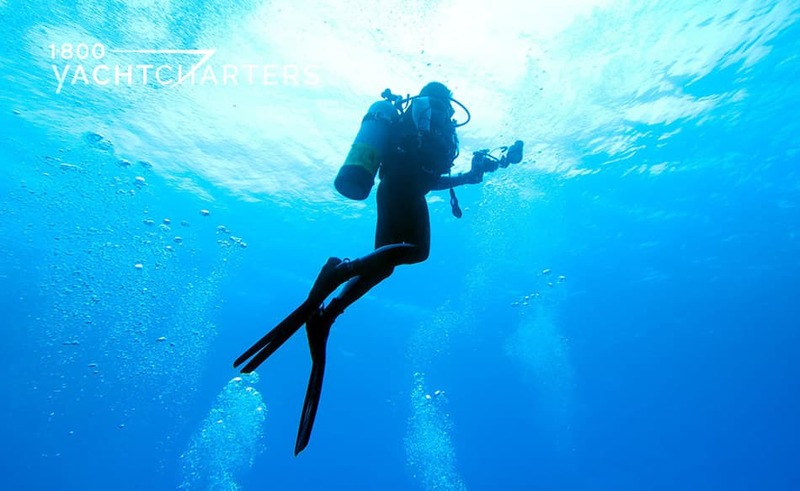 Contact our local charter guides for more details in Miami, the Florida Keys and nearby Bimini, Bahamas. The 2013 Fort Lauderdale International Boat Show, October 31-Nov 4, 2013, has drawn to a close. Picture-perfect weather brought out record numbers of boating enthusiasts. The 54th installment of the annual Fort Lauderdale International Boat Show, FLIBS, covers six locations and over 3 million square feet of space. Exhibits range from yacht builders and designers, to exotic cars and brokerage yachts. A variety of boats are on display, both in water and on land – runabouts, center consoles, cabin cruisers, skiffs, sailing yachts, tenders, superyachts, megayachts, powerboats, catamarans, and monohull sailboats. Of course the star attractions each year remain the extraordinary superyacht vessels that dominate the Caribbean yacht charter marketplace each winter. In addition to the hundreds of yachts on display, Sheeder points out the show is the perfect venue for inspecting and testing the hottest new watertoys. There’s an old saying in football – when your team is on offense, “take what the defense gives you.” In other words, make the most of the opportunities that come your way. No one understands that mentality more than our head honcho – Jana Sheeder, President of 1-800 Yacht Charters. Every President’s Day weekend, Jana rallies our team, and we invade the Miami Yacht Show, held in Miami Beach. This year’s show runs from February 15 – 19, 2018. Known predominately as a “sales” show, few yacht charter brokers attend, preferring to wait until the charter-only show season in late Spring. What they don’t realize (and Jana does) is that many charter yachts are quietly listed for sale, and they attend shows like Miami before entering the charter season. We use this opportunity to inspect yachts and interview crews privately – without our competitors trying to eavesdrop on our conversations. With fewer distractions and interruptions, we can spend more quality time with the crews – discussing our past charters, planning fresh itineraries and activities for guests, and always looking for ways to deliver a unique Superyacht Experience to our repeat clients. Of course, having more time to see the yachts only matters if you can get to the yachts – a tall task when the superyachts are spread across Miami Beach in two locations – one in front of the classic hotels along Collins Avenue, and the other 4 miles to the south, at Jungle Island Deep Harbor Marina. Fortunately for us, Jana developed the ultimate solution to avoid gridlock – we zip around the marinas and pull up at the docks via boat! Professional, fun, and unique – wonder what she has up her sleeve for the future? BLISS – 145 Foot Heesen charteryacht – a fantastic modern yacht with a fun-loving crew who delivered a memorable Balearic islands yacht charter holiday to one of our Dutch clients and his family last July. QUITE ESSENTIAL – 180 Foot Heesen – eco-friendly motoryacht with impressive looks and great interior comfort. Another great superyacht for clients. We also took the opportunity to inspect some brand new yachts for sale. Why would we look at yachts not currently in charter? Many buyers in the market for a brand new yacht will often buy a yacht, then enter it into the charter marketplace. If this is done after the boat show season, there may not be an opportunity to inspect the yacht for many months. 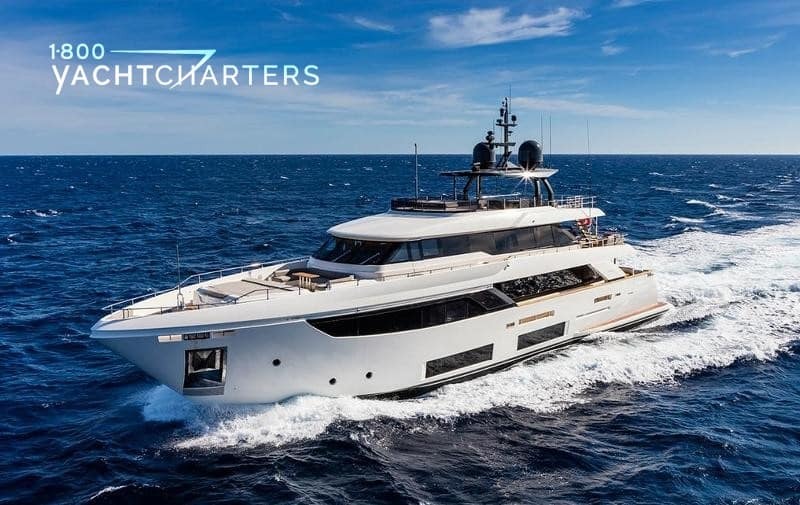 We prefer to promote charter yachts that we have inspected, and while that’s not always the case, taking the time to look at popular, newly-built models increases the odds that we will see a new charter yacht before our competitors do. We’re always looking for ways to stay a step ahead! Our favorite new model at this year’s show is the NAVETTA 33, from the custom series of yachts built by Italy’s Ferretti Yachts. Ferretti has already sold ten hulls since the model was launched in 2017. After inspecting this yacht, it is easy to see why. The Navetta 33 Ferretti features a voluminous interior flooded with natural light through floor-to-ceiling windows. We walked through with one of our clients who has designed contemporary interiors for luxury suites in NBA arenas – and she was just as impressed! So there you have it – another great yacht show for 1-800 Yacht Charters. Jana took our team (and our clients) on some of the most popular luxury yacht charter vessels found anywhere in the world. We also saw newly built yachts, and we’re anxious to see them enter the charter market. New Strategy to Halt Lionfish Invasion – Eat ‘Em! Florida marine conservationists have a simple “recipe.” They say, EAT the lionfish! 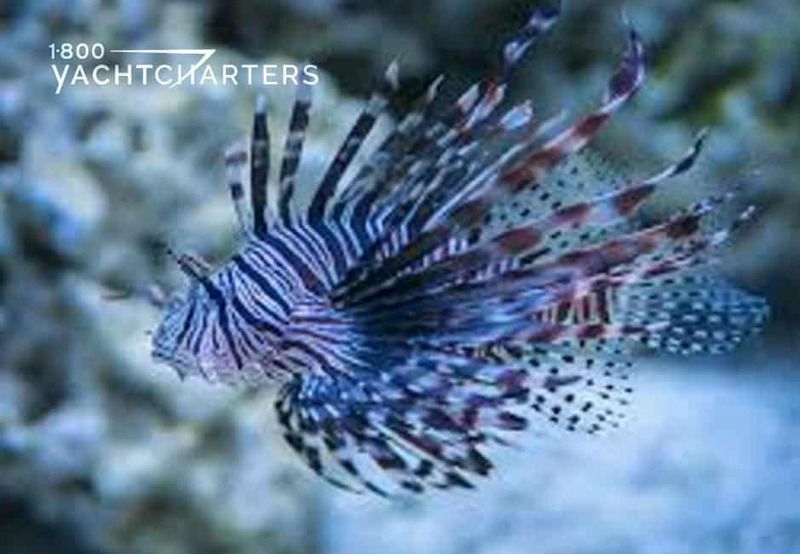 With few natural predators, Lionfish rapidly spread throughout the Caribbean and Atlantic waters. They voraciously prey on local fish, shrimp, and crab populations across the region and in Florida. Lionfish are a huge risk to world-famous coral reefs of the south. Bahamas yacht charter clients constantly see these venomous creatures. The Key Largo-based REEF conservation organization released “The Lionfish Cookbook.” It is a collection of 45 recipes to combat the red lionfish. With no government funds available to provide bounties or removal programs, conservationists hope to create a commercial demand for the fish. “It’s absolutely good eating — a delicacy. It’s delicately-flavored white meat, very buttery,” boasts Lad Akins. He is the director of special projects for the Reef Environmental Education Foundation. Akins authored the cookbook along with professional chef Tricia Ferguson. Researchers believe that Hurricane Andrew caused Red Lionfish to invade Florida waters in 1992. During that year, an aquarium broke and at least six fish spilled into Miami’s Biscayne Bay. The cookbook not only shares useful tips on collecting, handling, and preparing lionfish, but also provides expert background on its ecological impact. Are you ready to explore the Caribbean and taste some delicious lionfish menu items? Click https://www.1800yachtcharters.com/book-now-contact-us/ to start planning your vacation with 1-800 Yacht Charters. With Crew or Without – Which Private Yacht Charter Option is Right for You? 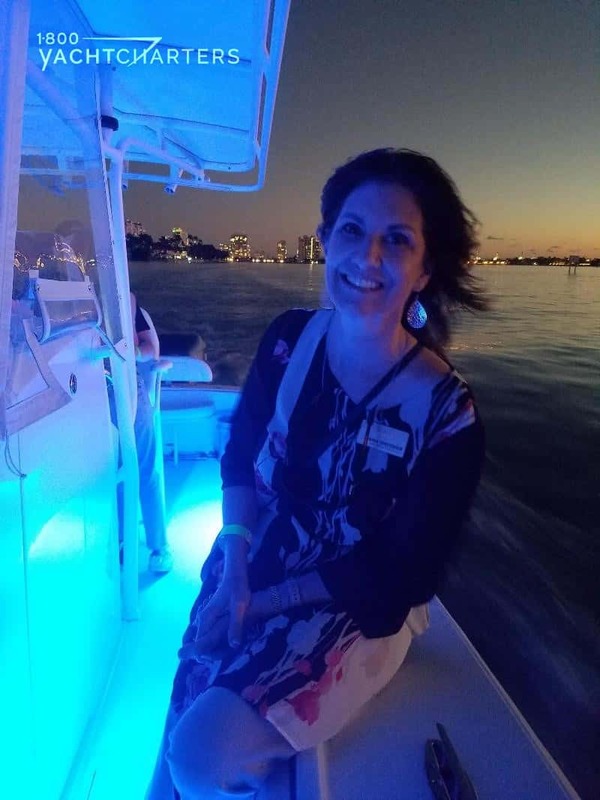 What a great idea, Pam – since you live in South Florida, a Florida yacht charter vacation in early summer is a great way to explore your “backyard,” at a time when most tourists have left the area. Fewer crowds equates to quiet anchorages! As a general rule, it IS more affordable to “DIY” (Do It Yourself) and drive your own bareboat (a boat that you rent without a hired crew). Affordability, however, is not the only important concern. CAPABILITY – When you rent a car, you are required to have a driver’s license. While no license is required to rent a bareboat, you ARE required to demonstrate experience and competency. If you are not capable of operating a bareboat, based on the submittal of a cruising qualifications resume, you will be required to retain a professional crew to operate your rental boat. RESPONSIBILITY – Even if you are qualified to rent a boat without crew, you must decide if you want the responsibility of operating your own yacht. When you rent a bareboat, you do it all – from safe navigation, to cooking and cleaning. Some people love the hands-on experience. Of course, this is not for everybody, as some people prefer to sit back, relax, and leave all chores and responsibilities to someone else. If this better describes you and your family, then a yacht with a crew is the way to go. On a crewed yacht charter, your crew is fully-responsible for the operation of the yacht, as well as cleaning/maintaining the yacht and preparing the meals for the guests. BUDGET – Like most vacations, your desired budget will often dictate which option is best for you. IF you are capable and enjoy the responsibility of operating a boat on your own, a bareboat #yachtcharter will give you the best bang for your dollar. If you want and can afford more than a “bare bones” vacation – one where you are served and #pampered the entire time – then a private luxury crewed yacht charter is the way to go. 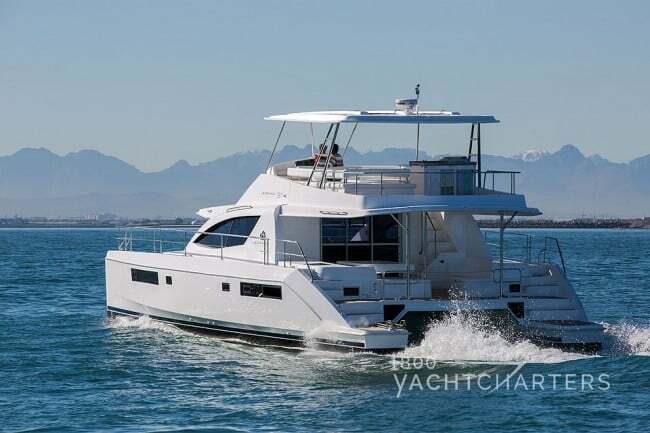 A 47 foot bareboat power catamaran in #Miami, suitable for 8 passengers, can be rented in the late spring, early summer for under $10,000 per week. In addition, you need to factor in the local tax (about 7%) and mandatory damage insurance (estimated at $50 per day). Of course, don’t forget to consider the cost of food and beverages for your family for the week (or for however long you charter your bareboat). A similar-sized crewed yacht, such as a 51 foot power catamaran, will cost approximately $21,000 per week, but this rate includes your meals, beverages, and a professional crew of 2. The only “unknown” expenditure is an optional gratuity for your crew. Here’s the good news! Whichever type of chartering is right for you – with or without crew — there is surely a boat out there within your budget and in line with your qualifications, capabilities, and desires. Let’s go #boating!! !